With an impressive resume that includes “Ancor Man”, “Mad Men”, “House” and more, Ian Casas joins the Band Pro crew at their Burbank, California location as their dedicated Dolly Specialist, “overseeing sales and support of the Cinetech Dolly line and related grip products”. BURBANK CA – June 16, 2016 – Band Pro Film & Digital, Inc. announced today that Mr. Ian S. Casas has joined the company’s Burbank Sales Team in the role of Product Manager. A veteran Hollywood Dolly & Key Grip on over 100 film & television productions, Mr. Casas’ professional career spans over 15 years. His grip department credits include such feature films as: ‘Anchor Man’, ‘Charlie’s Angels: Full Throttle’, ‘National Treasure’, and ‘War of the Worlds’; award-winning episodic dramas: ‘Mad Men’, ‘Bones’, ‘CSI: NY’, ‘House’; extensive commercial projects, and the list goes on. 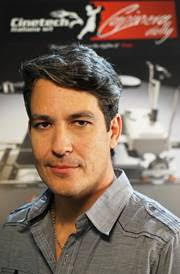 Mr. Casas will work as the company’s dedicated Dolly Specialist, overseeing sales and support of the Cinetech Dolly line and related grip products. Clients wishing to contact Mr. Casas to discuss upcoming projects or schedule product demos can email him at Ian.Casas@bandpro.com or call (818) 841-9655. Since 1984, Band Pro has specialized in products and solutions for professional filmmakers and videographers. With offices in Atlanta, Burbank, New York City, Munich, and Tel Aviv, Band Pro offers the highest level of knowledge and expertise along with the finest equipment and accessories available. Our close relationships both in Hollywood and worldwide, combined with our long-standing camera and lens maker partnerships, have kept us at the forefront of digital cinematography innovation.